Beckemeyer is located in the heart of Clinton County, Illinois. A growing rural community situated just 45 minutes east of St. Louis, Missouri. Because Beckemeyer is just 5 minutes from Carlyle Lake, it offers the option of outdoor entertainment along with the quiet of rural living. Major highways are a short drive away – Rt. 50 through the center of town, I-64 to the South, I-57 to the East, I-55 and I-70 to the North. Two airports serve the Beckemeyer area: Mid-America Airport located near Scott Air Force Base (30 miles away) and Lambert International Airport in St. Louis (70 miles away). Following is a history of Beckemeyer as compiled by Amy Kruse Froess as her high school research project in 1990. We thank Amy for compiling this history for us. If many people think that Beckemeyer has always been a dull village, they should think again. There once were many interesting places and things to do to occupy one's time. In my paper, I will explain Beckemeyer's history, with the many adventures that come with a growing and prosperous village. The first immigrants came to Illinois by the Mississippi River. As the settlers increased, they ventured east until they reached Silver Creek, near Lebanon. After this venture, many settlers wanted to try a different route. They packed up what few belongings they had and headed south. They crossed the road leading from Ford's Ferry below Shawneetown, to Goshen, as Madison County was then known. The road and wanderers continued until they passed through Carlyle. The immigrants finally decided to settle west of Carlyle, thereby starting the growth of Clinton County, which included the community of Buxton. S amuel B. Watkins was best known as the greatest pioneer of "Buxton," or what was eventually known as Beckemeyer. He entered and settled into the state during 1812 ("Beckemeyer, A Progressive Village"). At this time there were many Indians in Buxton's settlement. They roamed through the forests and fished in the streams. In 1817, Watkins decided to build his home in a timber near Beaver Creek. Watkin's home was built from animal skins. Buxton began as a way station on the Ohio and Mississippi Railroad. In 1866 the way station was organized and distributed into two lots by Zepher Case. Zepher Case named the small village "Buxton" in honor of an attorney of the railroad. This attorney's name was H.P. Buxton ("Beckemeyer, A Progressive Village"). In 1880, there was a post office. It was located inside a box‑car along the Mississippi and Ohio Railroad tracks ("Beckemeyer, A Progressive Village"). Buxton did not show promise of growing into a bigger settlement because it was too close to the County Seat of Carlyle. In the earlier days Buxton had a small store, but shortly after it opened, it went bankrupt. In 1894, Buxton's population began to rise. This was caused by the discovery of a coal vein underlying the area ("Beckemeyer, A Progressive Village"). Back in the early 1900's there were many entertainment and business shops in Beckemeyer. These included a barber shop, a mill, a mine, a zinc smelter, two banks, a saw and grist mill, three large general stores, two smaller general stores, two hotels, one restaurant, seven saloons, a telephone exchange, a large hardware store, two lumber yards, t wo livery stables, two theaters, and three churches. One of the seven saloons, named Zinschlag and Strotheide, was started in the year 1900. It was owned by two brothers, named A.E. and William Zinschlag. At this saloon, the brothers were wholesalers and retailers of wines, whiskey, and cigars. The Zinschlag brothers handled all the leading brands of wine, liquor, and cigars and made a specialty of selling Lemps and Central beer. The Zinschlag and Strotheide saloon was the largest in Buxton and had in connection a pool hall ("Beckemeyer, A Progressive Village"). Beckemeyer Lumber Yard was the oldest lumber yard operated in Buxton. 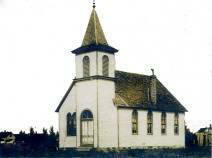 It was started in March 1904 by H.C. and Fred Beckemeyer ("Beckemeyer, A Progressive Village"). The Beckemeyer Methodist Episcopal Church assembled in the year 1904 (Methodist Church Bulletin). On July 15th, 1904, the vein of coal in the coal mine was reached. It measured eight feet wide, seven inches long. At this time it was reported that it had the most layers of coal in Southern Illinois. This is why Buxton proliferated. The coal mine created Jobs, which in turn brought more people to Buxton. As of January 20th, 1905, the mine averaged hoisting three railroad cars of coal daily. But the next day, January 21st, the mine had its first explosion. After a powder shot had been fired, a chain reaction was started, and a fire swept down the entry of the coal mine at a devastating rate. Many employees at the mine were badly burned. On February 22nd, 1905, there was an election held to change the name of Buxton to Beckemeyer. The Village of Beckemeyer would be incorporated under the General Law of the State, meaning that the place would no longer be called "Buxton." The first stop towards changing the name of the village was the incorporation of the community. This was largely due to the efforts of August Beckemeyer. Then, after the new depot was completed, the name was changed by the railway company. The last step of changing the name of the village was on October 1st, 1905, when the Post Office Department officially recognized the name of Beckemeyer. There was a humorous story being told during this time. "A member of the Beckemeyer family was a passenger on a train passing thru Clinton County when the brakeman yelled, 'Beckemeyer.' The young man rushed up to the brakeman and said, 'Here I am, what do you want?'" The brakeman then explained he had been calling out the name of the next stop (Charter). On Friday, April 25th, 1905 a tornado, then thought of as a cyclone, caused 200,000 dollars worth of damage to the village of Carlyle. Buxton, now incorporated into the Village of Beckemeyer, suffered minor damages when compared to Carlyle. Beckemeyer's first baseball team was called "The Liberty's." During July of 1905 the first school and library were started, and H.H. Beckemeyer was the first teacher. Seven months later, the school library was increased by sixty‑eight volumes. All of the books were bought by money raised by the school through entertainment and picnics. The amazing fact was that the library and its contents were worth more than the school house and the ground upon which it stood (Washford)! A contract for a new school building was awarded to Amos Ingold for $3,040. The now school was to be opened on October 1st, 1905, and H.H. Beckemeyer was to be the principal. In 1905 the first Sunday school classes for the Methodist Church started (Methodist Church Bulletin). They were held in the home of Mrs. Cleona Clabaugh, who was the first Sunday school superintendent. A majority of the Sunday school members were the miners' children (Methodist Church Bulletin). The carpentry work for the church was begun on the 26th of July, 1905. Some of the lumber that was used to build the Methodist Church had also been used at the St. Louis World's Fair. The lumber was hauled by the railroad to Beckemeyer. The first Reverend was E.W. Grupe. He contributed to and helped organize many deeds for the church. These contributions included organizing the church, the Sunday school, and the Epworth League. The Epworth League was a young person's organization. In addition, some people believed the Reverend Grupe started the church's first Lad ies' Aid Society (Methodist Church Bulletin). In the early times of the Methodist Church, a revival was held. It was thought to be the biggest and the best revival in the church's history. During the revival, the Sunday school members contributed many objects to the church. These objects included a clock, a baptismal font, and an electric cross. On August 11th and 12th, a Quarterly Conference was hold. At the conference, C.W. Scott and August Beckemeyer were appointed to a committee to borrow funds for the church to liquidate the debt of the church and to have the property insured (Methodist Church Bulletin). In the early days of Beckemeyer, there was no Catholic church. Reverend Bishop Jansen and Father Hoellman encouraged the building of a Catholic church. With these two men's leadership and the willingness of the people, the Catholic church was finally going to be erected. The Catholics of Beckemeyer realized the construction of the church would take time, money, and courage, but they always said, "Where there's a will, there's a way" ("The History Of St. Anthony's Church, Beckemeyer"). The ground for the church, formerly a potato patch, was donated by John Taphorn, Senior. The work on the church, done by farmers and other laborers, occurred mostly by moonlight. On December 19th, 1905, the church was dedicated by Reverend Bishop Jansen. The Catholic school opened on December 25th, 1905. Sister Leonora was the first sister who taught school. The average number of children in attendance was 125. The first chair consisted of fourteen girls and seven boys. The first bank in Beckemeyer was organized in 1906. The bank was a branch of the Carlyle's Farmers' and Merchants' Bank and was a private banking institution. The bank's equipment included a safe and a burglar and fire‑proof vault. Mr. Mahlandt was the bank's cashier ("Beckemeyer, A Progressive Village"). The first hardware business started in 1907. It was owned by H.P. Brefeld. His hardware business sold staves, tinware, guttering, roofing, cutlery, sporting goods, sewing machines, bicycles, paints, nails, and pumps. 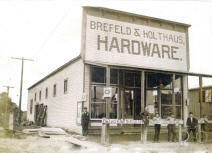 Brefeld also did plumbing tinning, and installing heating and lighting plants ("Beckemeyer, A Progressive Village"). During the year of 1919 oil was discovered in Beckemeyer, and was wrongly predicted to become the greatest oil center in the state. In the hope of becoming rich from the oil, many prospectors bought options and leases for the land surrounding Beckemeyer. This period was known as the boom, but when the true amount of oil was known, the boom receded ("Beckemeyer, A Progressive Village"). In 1911 a now convent was built for the Sisters of the Catholic church. In 1912 there were twenty‑five producers of oil. The Ohio Oil Company purchased fields of oil from many owners. In 1912, Fred Beckemeyer became the sole owner of the lumber yard. Some of the lumber yard's products included laths, shingles, mill work, building material, lime, cement, and plaster. The lumber that was produced at Beckemeyer, was shipped all over the southern and eastern part of the country (“Beckemeyer, A Progressive Village"). Ben Hoffman started a livery and sales stables in the year 1912. In addition to this business, Hoffman ran an automobile for the accommodation of passengers. He carried the passengers all over the county ("Beckemeyer, A Progressive Village"). There were six societies in the Catholic Church. They included St. Joseph's Men Society, St. Ann's Ladies Society, St. Aloysius Young Men's Society, St. Agnes Young Ladies' Sodality, St. Anthony's I. & E. Club, and Branch Number 107. As of 1912, there were 125 Catholic Church members, who were mostly native Americans of German descent. In 1927, the foundation for the now church was laid, and in 1930 the silver Jubilee was celebrated for the erection of the new church (The History Of St. Anthony's Church, Beckemeyer). On March 5th, 1933, a fire destroyed the Beckemeyer coal mine screening plant. Herman Dalhaus, engineer, saw the flames and summoned help. In the same month, on the 23rd, the air shaft at the mine caved in and had to be reconstructed before the mine could be placed in operative condition. In 1935 the mine closed down. Beckemeyer has a monument near the American Legion, dedicated to the village members lost in the mine that year (see history of Miner Monument). Beckemeyer continued as a rural, farming community until the boom of the 1990s when new businesses, stores, restaurants, hotels and industry grew up all around Clinton County. Today Beckemeyer offers the quiet life of living in the country, along with the opportunities of nearby major cities. Beckemeyer is where charm and country come together.